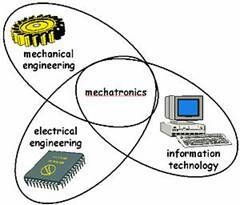 In diverse situations I have been asked by people from different backgrounds about mechatronics. If you think it is difficult to explain to a friend of yours, convince a management board to adopt this strategy is not an easy task either. Here I have collected an overview over mechatronics, fuzzy logic and neural networks, what for me are the pillars of modern manufacturing. The rising of this technology have to be seen in the widespread availability of low cost microcontrollers, but it is also the natural evolution of the process of engineering disciplines applied to day to day electromechanical systems. Intelligent systems are usually asociated with human beings, this is directly related with mechatronics. Skeleton and muscles would be the mechanical discipline, while eyes, other sensors and connection between them would relay on electric/electronic disciplines. The functions of the brain, information processing and genertion of stimulus are linked with computer engineering. On the left hand side combination of resources implicit in mechatronics technology. On the right hand side a mechatronics aplication. 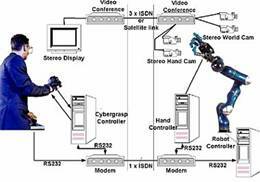 The robot simulates the movements of a human hand captured by sensors, then processed, and reproduced by the robotic hand. Mechatronics as an organizational strategy? Evidence of this raising technology can be seen in an internationsl initiative for research and developement for the next generation of manufacturing and processing technologies, where companies from the 5 continents are participating. This initiative is IMS, and aims to reduce R&D costs, and expand international markets. ‘Intelligent manufacturing systems are already widespread, and this optimization of the process through the use of intelligent systems is continuing, and is the theme of the multinational, industry-driven intelligent manufacturing systems (Intelligent Manufacturing Systems) initiative, which started in 1995. Currently projects with a value of $240 million are being undertaken through the IMS’ Hollinghum, J. (1999). ‘A neural network,… attempts to reproduce electronically through the use of artificial ‘neurons’ the functions of the human brain. The resulting network consists of the parallel combination of a large number of simple processing elements, essentially summing junctions, which, instead of being programmed, are trained how to carry out a particular task. This ability of neural network to learn and to modify its response as a result of training has been a major factor in their development…’ (Mechatronics, D, Bradley pp147). The analogies with the animal brain of this structures can be sumarized. Multiple inputs are connected to a node, emulating the multiple dendrites connected to a cell body (neuron). This cell body is in charge of weighting and process the info based on a learned patron, and produce a signal driven to the output. This ouptut (can be referred as the axon in the animal neuron) it is usually connected again to other inputs where the process continues. One of the interesting aspects of neural networks is their capability of ‘learning’. ‘In terms of processing information, there are no computer programs here the “knwoledge” the network has is supposed to be stored in its weights, which evolver by a process of adaptation to stimulus from a set of patter examples. In one training paradigm called supervised learning’ Gurney, K (1997) If a new pattern arises, the network is able to classify the core of the problem, and generate a correct answer. This process is called generalization. Despite in the brain, different zones are in charge of different processes, if one of this parts is lost or damaged other parts of the brain can learn to carry that functions. At the same time, animal brains are capable of processing the correct information in noisy environments (the voice of the teacher can be disguissed even when a heavy machine is working outside generating noise). The same aspects are faced with artificial neural networks, that are able to provide a correct output also when the input is incomplete, noisy or some parts of the network are damaged. Thanks that the knowledge is spread over the network, and tolerance values are inherited in the patterns. It can not be undervalued the capability of the neural networks for processing different tasks at the same time or parallelism. It is necessary to to clarify that for building a neural network it is not possible to grab a bunch of ressistors and IC’s for this (Although they can be necessary in some part of the process). Usually the networks are simulated on a PC or workstation, or at least, in a microprocessor. 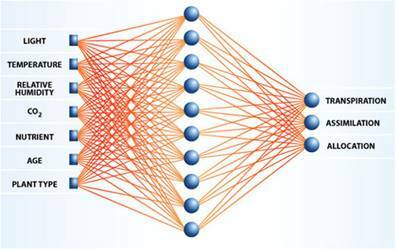 Neural Networks nowadays provide enhancement of many processes as: speech recognition, image processing and analysis, processing of sensor data, market forecast. Let’s see a proper example. In some laboratory, are investigating over green mass (plant) generation. The traditional process from a vegetable have to be simulated like photosynthesis, transpiration, water released through the leaves, water absoved via the roots, carbon consumption, and others. The cuantities of water, generation of green mass and carbon consumption differ very much on the kind of plant, age and environmental conditions. A neural network has been proposed. Structure of the neural network applied for a laboratory investigating green mass. The nodes and connections can be appreciate as similar to animal brain ones. The paterns are set in base of the kind of plant, and their performance under determinated conditions and how other conditions could modify the devopement of the plant. The inputs that can be seen on the left of the diagram can be taken from sensors in a green house, or can be simulated from hypothetical scenarios. The learned patterns relay in the central nodes, while on the righ we have the outputs. This information could be used to adjust the conditions of the green house for an optimum developement of the plants (starting again the process as new inputs), or just evaluated over the desired performances. Our environment, the world around us is analogue, and so are human feelings and language. We can feel very cold or really hot, depending on the situation (20 ºC can be hot in winter time, but not in August), and our conversations are plenty of ‘the tube was packed this morning’ or ‘there were just a few people in the pub’. Despite this ‘cold’ or ‘hot’, ‘packed’ or ‘few’ are not exactly determined, aproximate boundaries are asociated with this expresions, based in our experience. Fuzzy logic attemts to imitate this this human reactions to such undetermined information. For doing this, the information or universe must be classified into different sets. This sets can be related between them with different definitions as ‘union’, ‘intersection’ or ‘complement’. The logic will be applied based in if the values or membership functions belong to one set or not, typically assigning values of ‘1’ or ‘0’. Without forgetting the fuzzy characteristic, this values can be ‘totally 1’ or ‘just 1’ depending on the affinity given by the membership function. To perform fuzzy reasoning, ‘IF…THEN…’, ‘OR’, ‘AND’ rules are applied. 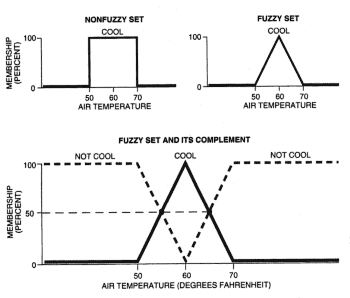 It was not untill the early 90’s when fuzzy logic was applied to home electronic products and the general population became aware of fuzzy systems. Nowadays, Fuzzy logic is applied to control washing machines, dishwashers, ABS in automobile industry, elevators digital cameras and many others. e.g. The Fuzzy Washing Machine: A fuzzy controller for a washing machine can work as follows, the washing machine, always works during 10 minutes, to ensure that the user is satisfied, if the clothes are dirty or not. Then, it adds minutes to this base of 10 minutes, depending on how dirty the clothes are, adding 2 minutes to the program for each level of dirt in the water. After this process another fuzzy system gets involved. The washing machine rinses for 5 minutes, if too much washing powder has been added by the user, it rinses for two extra minutes untill to ensure the clothes are free of soap. In this example, the universe could be the clothes, and the sets are going to be how dirty the clothes are, and how much shoap we have added. Different information is gathered for the different sets (how dirty, how much shoap), and wheighted depending on the importance (this process is named fuzzyfication). An appropiate washing program is designed by a fuzzy control system (extra time, less rinsing), and then, through a process of deffuzyfication, actions are taken in order of the previous sets (continue turning, taking less water). Cetinkunt, S. (2007) Mechatronics. WILEY, Hoboken.